Visitors take a stroll at Home Hill Winery. In the modest vestibule of a vaulted-ceiling building on the outskirts of Hobart, as a full day of guidance and contemplation nears its end, the spirits move me and I am converted there and then. Some of the group look joyful and clap at the announcement. One person tells me I am welcome at this establishment anytime. Angela Reeve just leans back on her chair with a look that says: my work here is done. 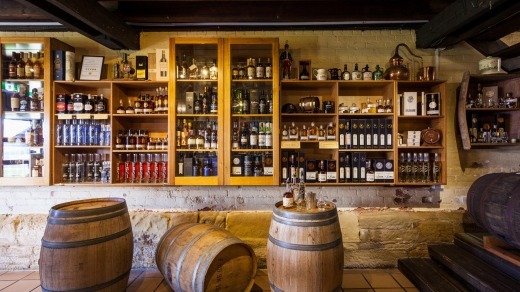 In 2014 a company called Tasmanian Whisky Tours launched here in the south of the state. 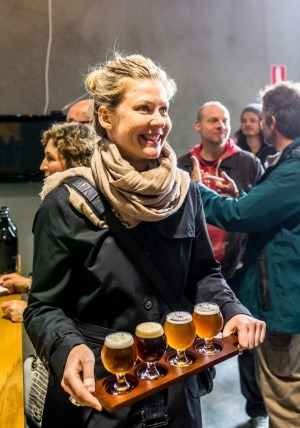 Demand and encouragement saw it expand into wine, beer and cider tours to become Drink Tasmania. Yet its signature tour – a blend of all four products – still peaked, for me at least, with the liquor that first lit Brett Steel's fire. Willie Smiths Organic Apple Cider. Steel tasted his first single malt whisky; a 10-year-old Ardbeg from Scotland's Inner Hebrides. "Quite a smoky, heavily peated whisky. I'd never had anything like that before. I was completely blown away." Back in Australia, he visited Tasmania for the first time in 2008. Not specifically for whisky but, it was midwinter so he found himself nosing plenty of it in front of open fires and the trip activated both brain and heart. Steel saw what Tasmania's contemporary whisky pioneers, Lyn and Bill Lark, and other distillers were doing and recognised "similarities between the burgeoning whisky industry and the history I knew of wine in Australia in the late 70s and early 80s". The introduction of the wine equalisation tax allowed Australian wines to be competitive on the international market; Steel felt whisky was set to receive similar government support. There was also "a real awakening of the senses … of taste, smell and everything just felt a bit more vibrant down here and … took me back to my time of being in Scotland … I totally fell in love". He returned every 18 months then moved to Hobart in 2011 thinking he might open a bar, then noticed a gap in the market. 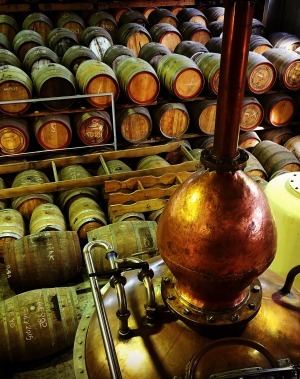 Steel launched Tasmanian Whisky Tours in early 2014. 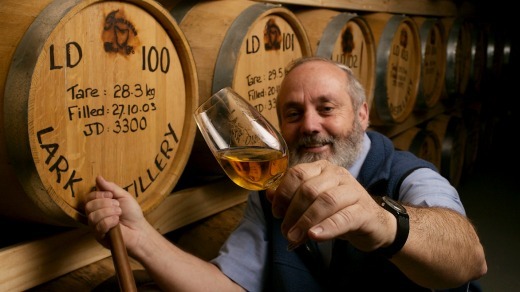 Six weeks later, Sullivans Cove's French Oak won World's Best Single Malt Whisky at the World Whisky Awards in London. Steel now calls it "very fortunate timing" though I reckon he uppercut the air when it happened. That morning, Reeve had met a group of us at Brooke Street Pier on Hobart's waterfront. Over coffee and sloe berry gin from McHenry on the Tasman Peninsula, we heard about the colony's shaky initial attempts to produce alcohol; from planting the wrong types of grapes on Maria Island to John Franklin's 1830s ban on distilling – a law that remained until the Larks challenged it in the early 1990s. Beer tasting at Last Rites Brewery. Before that, in the 1950s, two European migrants refused to accept wine couldn't be produced in Tasmania. One was Italian textile merchant Claudio Alcorso, who founded Moorilla – where Mona now stands – and initially trialled riesling. Reeve, who is a sixth generation Tasmanian, remembers Alcorso from childhood as "a beautiful man". 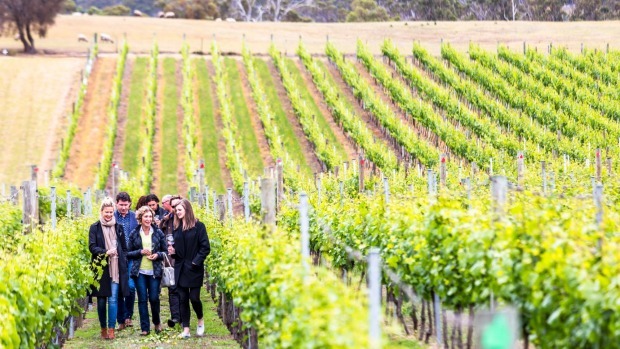 Tasmania now produces only 4 per cent of Australian wines but 10 per cent of its fine and superfine. With that in our minds, Reeve transports us to the valley of her matriarchal ancestors for a tasting at family-owned and operated Home Hill, in the Huon. Their 2014 Kelly's Reserve Pinot Noir won two major trophies at the Royal Melbourne Wine Awards last year. "My role today is to take you to the places where people can tell their own stories," she says. "I'm the narrator and they're the experts." 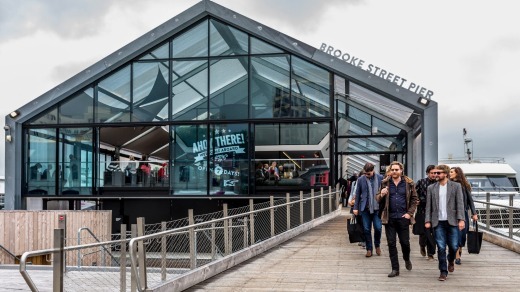 Drink Tasmania tours kick off from Brooke Street Pier. We settle into a sunny spot in Home Hill's rammed-earth restaurant looking straight out on its autumn-yellow grapevines, just one gusty day away from bare. We meet winemaker, Gilli Lipscombe, whose brain we could have picked for far longer. 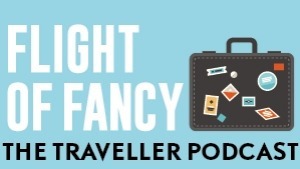 The six places chosen for this tour all have a particular distinctive quality. And, as Reeve says, "it's craft, so every place is utterly different from each other". Pagan Cider's cellar door is a shed in a working cherry orchard on the road to Cygnet. Despite its exquisite labelling, there's no pretension; just a down-to-earth generosity of product and knowledge. Employee Ryan Lucas has "a real aversion to telling people what they're tasting" and genuinely wanted our feedback. His explanations quickly gave us language to join the conversation. Barrels and stills at Sullivans Cove in Cambridge. 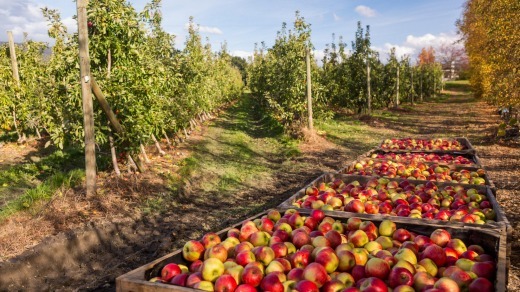 Pagan uses four types of apple – none of them cider apples – and the season dictates the fruit then "the fruit dictates what we get". They use fruit from this abundant valley that would otherwise be wasted, such as cherries split from heavy rainfall. Along with the apple, pear and cherry standards, we also tried scrumpy, raspberry, blackberry, mixed fruit, quince, strawberry and apricot. Apple cider provides the alcoholic base for these blends and sugar is never added. Back up the road at Willie Smith's, where we buy lunch, flights of four ciders land on the table along with an information sheet. Reeve calls this opportunity to consecutively try three apple ciders from the same producer "a great chance to teach your tastebuds". The perry is like biting into a juicy pear. On the way back to Hobart for a whisky at the Lark, Reeve describes Tasmania as "a little Scotland without the pollution". "We've got really really pure water, we've got some peat in the central highlands and peat along the north coast." At Sullivans Cove in Cambridge, Heather Swart explains the distillation process while overlooking stills and barrels. 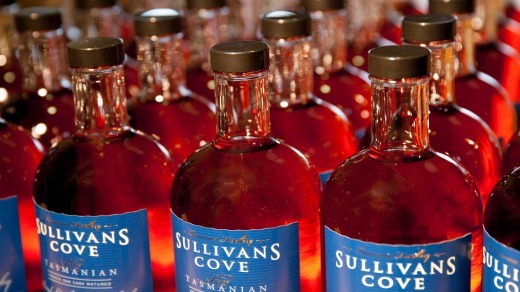 Sullivans Cove's award-winning French Oak single malt gets bottled one at a time. Gathered on lounges, we try a single malt blend then the award-winning French Oak but it was the American Oak that got to me. "Socrates with spurs," Swart calls it. "It engages the mind, it's quite complex but it makes you want to put on your western boots and go for a ride." I learnt the Tennessee chew and sang hallelujah. Last Rites Brewing Co's well patronised six-tap industrial-style cellar door nearby backs onto a graveyard. Former research chemist Phil Zakaria is head brewer and, with four others, opened Last Rites last year. As we tried Pina Colada, The Last Dog, She's No Bette Midler, Zakaria talked us through the process of their new world, hops-driven ales with focused intensity. It's the same passion for craft empowering so many Tasmanians. I had wondered, after first speaking to Steel, if Drink Tasmania was a diluted version of his original whisky tour dream. Maybe, but it doesn't really seem to matter. I see him standing in a bow tie at a shiny microphone; he welcomes the audience then joins the narrators at the side of the stage as the curtains open and the scene unfolds. Elspeth Callender was a guest of Drink Tasmania.